The Lunesdale Poor Law Union was created in 1869 following the abolition of the Caton Gilbert Union, many of whose members it inherited. The new union, which formally came into being on 15th March 1869, comprised 22 parishes as listed below. County of Lancaster: Arkholme-with-Cawood, Borwick, Burrow-with-Burrow, Cantsfield, Caton, Claughton, Farleton, Gressingham, Halton, Hornby, Ireby, Leck, Melling-with-Wrayton, Nether Kellet, Over Kellet, Quernmore, Roeburndale, Tatham, Tunstal, Wennington, Whittington, Wray-with-Botton. Each locality was represented by a single member on the union's Board of Guardians. The population falling within the union at the 1861 census had been 6,486 with parishes and townships ranging in size from Farleton (population 75) to Caton (1,160). The new Lunesdale Union workhouse was erected at a site to the south of Hornby in 1872. It was a simple T-shaped plan facing to the north. The entrance and Master's quarters probably lay at the centre, with separate male and female accommodation to each side. A separate block to the south may have been a small infirmary. The workhouse location and layout are shown on the 1913 OS map. Lunesdale from the north-east, 2001. 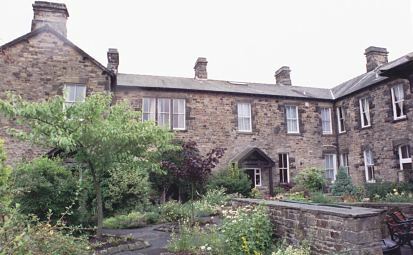 Lunesdale from the east, 2001. 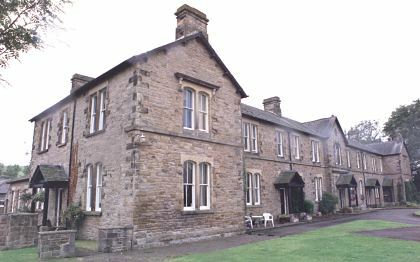 The workhouse buildings were later used as offices but have now been redeveloped for residential use. Lancashire Record Office, Bow Lane, Preston, Lancashire, PR1 2RE. Few records survive — holdings include Guardians' minutes (1869-1900).